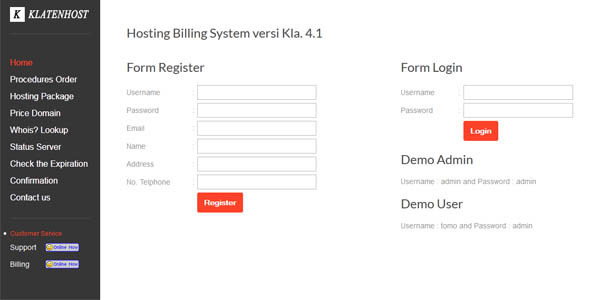 Project management tools simple hosting billing system or reseller webhosting. 1 . BROWSER , AS GOOGLE CHROME , MOZILLA FIREFOX AND OTHER SO . HOW TO WORK OR TRANSACTION PROCESS FLOW . 1 . PROSPECTIVE BUYER MUST LOGIN FIRST , BEFORE THAT SURELY MUST REGISTER IN THE REGISTRATION FORM . 2 . LOGIN PROCESS AND DO THEN PRINT TRANSACTION PURCHASE INVOICE . 3 . USER AFTER PAYMENT CONFIRMATION AND PAYMENT THEN DO ADMIN check the status of their order . 4 . Memperoses ORDER BY PRESSING BUTTON EDIT . 5 . THEN PUTTING cpanel USERNAME AND PASSWORD . 6 . WHEN THEN IN THE MENU WILL APPEAR THEN USER INFORMATION ALREADY PAID AND ACCOUNTS cpanel . 1. PROSPECTIVE BUYERS PLEASE REGISTER FIRST DIRECTED TO DO THE TRANSACTION, THE AIMS TO PROSPECTIVE BUYERS WE HAVE DATA AND GIVE DISCOUNT PRICE OR PIECES IF NOT SO BUY.